The moment of transition. From man to legend. Spoilers ahoy! I came by accident across the anime Aoki Densetsu Shoot (Blue Legend Shoot) and when I heard the beginning of the opening song, I knew that it would be good. It is very rare that the opening (and, slightly less important, the ending) song does not give off a “vibe” about the anime. If it is spooky, angry or disharmonious, you can be sure that the anime is also aiming at people who treasure such feelings. The Japanese are quite good at matching such things, I have seen only a very few exceptions to this. I have watched 20 episodes over the last few days, and am glad I did. It is quite old, from 1993, and you can kind of see this. It must have been a fairly high-end production at the time, I guess, but because they did not have computer assistance in the production back then, they had to use certain shortcuts to make the desired effects, and the resolution is simply lower than today. It is quite well drawn though. In any case, the anime is nominally about soccer, but really about people and their dedication to their highest aspiration. This is something that has begun to interest me more lately. The first 20 episodes are about the team under the leadership of Kubo. Having spent three years in Germany, he returns to find that Japanese soccer is too rigid. He wants to play “fun soccer” where each player uses his strength and where cooperation is built on trust, not on hierarchy and planning. He finds little understanding for this in Japan, but eventually gathers a small team of high schoolers who follow his path. Most of them look up to him as a prodigy or genius. But the truth, as with so many a genius, is that his skill comes from deep love and relentless training. Tragedy strikes in episode 19. Kubo has not told his teammates that he has leukemia, and during an important match he does something unreasonable if not impossible: Taking the ball from the home goal, past all 11 players of the opposing team, into their goal. Â At the moment of his greatest triumph, his body gives up, and he dies just as he is being declared a legend. It is indeed few people who become a legend while alive, though it does happen. More become legends after their death. And for some, it happens at the same time. This is typically martyrs, and I guess Kubo is one of them, in a manner of speaking. I have to agree with his best friends that dying for soccer is stupid. But because they all know and share his love for soccer, they could understand him. The main character of the anime, the freshman Toshi, saw this duality: Kubo was “a godlike person”, but at the same time he was just like them, a high schooler who just loved soccer more than everything. 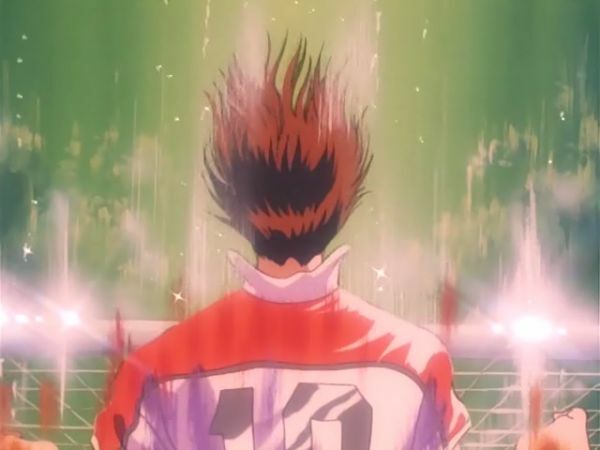 Having an important character die during the series seems to be pretty common in sports anime, or perhaps I just happen across those for some obscure reason. The other two sports anime that I have found worth watching were about baseball, and both of them had a main character die during the anime. There is probably some very Japanese reason for this. Or, as I said, perhaps I somehow mysteriously am pulled toward these. Even if I have never seen them before or even read the reviews, perhaps the voice in my heart are picking them out for me. Although I kind of doubt that. Or at least not much more than it picks out my Pepsi. Who knows. If life is like a dream, who is the dreamer? This entry was posted in autobiography, review, slice of life and tagged anime by itlandm. Bookmark the permalink.